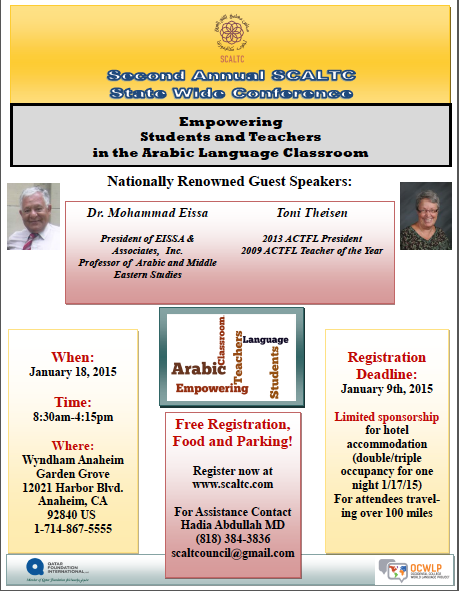 Southern California Arabic Language Teacher Council (SCALTC) invites you to our Second Annual State Wide Conference! The President of EISSA & ASSOCIATES, Inc., specialized firm in Consulting and Educational services in the areas of Arabic/Islamic studies. He serves as an Associate member in the Centre of Middle Eastern Studies at University of Chicago. Dr. Eissa has been engaged in teaching and conducting research in the areas of Arabic language, literature, culture and Islamic studies at distinguished academic institutions in Egypt and USA. He has been actively engaged in innovative projects promoting Arabic and Islamic studies with special interests in research and teachers’ training. His focus is on fostering application of modern pedagogical methodologies and utilization of technology in teaching Arabic as a foreign/second language. He is continuing uninterrupted contribution to several other academic activities including promotion of contemporary Islamic thought, translation and editing of Islamic texts, conference panels presentations. Dr. Eissa has received his basic elementary, secondary, undergraduate and graduate education at Al-Azhar Institutes and Al-Azhar University in Cairo, ending with Ph. D. degree (1978). Post graduate studies at University of California Los Angeles (UCLA) culminated by obtaining C. Phil degree (1984). He has acquired knowledge of special interest in numerous courses in the areas of second language acquisition; applied linguistics; curriculum & material design; and application of technology in teaching and research. Dr. Eissa is engaged with the Arab academic and professional communities at multiple levels. He dedicate portion of his time to serving in committees and grass-root activities to promote Arabic language & culture education at large. The 2013 ACTFL President and the 2009 ACTFL Teacher of the Year, teaches French at Loveland High School in Loveland, Colorado where she is also the district WL Curriculum Representative. Theisen is a National Board Certified Teacher with a M.A. in Foreign Language Teaching and a M. A. in Education of Diverse Learners. She is also a Google Certified teacher.Very active in the foreign language profession, Theisen has presented many workshops, keynotes and webinars for national, regional, and state conferences and has authored articles on Multiple Intelligences, Differentiated Instruction and Technology for the 21st century learner. Theisen presented “Activating Communication” as part of the first ACTFL Webinar series and also presented at the 2011 LARC STARTALK Institute at San Diego State University. Theisen has participated on many committees including the revision of the World Languages teacher standards for licensure. She chaired the 2009 revision of the Colorado World Languages Academic Standards. She served on the committee for the National Board for Professional Teacher Standards in 2000 and was the co-chair for the revision committee of the NBPTS Teacher Standards for WLOE in 2009. Most recently she chaired the ACTFL 21st Century Skills Map committee in collaboration with the Partnership for 21st Century Learning. Theisen served as President of the Colorado Congress of Foreign Teachers in 1988-89. As an ACTFL Executive Board member from 2001-2005, Toni served as the program chair for the 2004 and 2005 conferences. She was the Local Chair for the CSC, SWCOLT and CCFLT Joint Conference in 1988 and the Program Chair for the 1991 Central States Conference. Theisen has received many honors including the ACTFL Nelson Brooks Award for the Teaching of Culture, The Colorado Governor's Award for Excellence in Teaching, the SWCOLT Excellence in Teaching Award and the Genevieve Overman Memorial Service Award from the Colorado Congress of Foreign Language Teachers.